Every now and again, I like to try out a new project or theme with my scientists. I’ve been itching to try this project with my group for a while, and I’m glad we finally had a chance to tackle robotics and creating our own articulated hand models. As with most of my programs, we first started with a brief overview of robotics. What is a robot? While we often think of humanoid robots when the subject comes up, robots actually come in all shapes, sizes, and colors. For example, there are robot vacuums, and lawn mowers, and even robotic arms that assist on assembly lines in factories. Simply defined, a robot is a machine with movable parts that can make decisions and do a job or perform a function without assistance. A robot can be similar to a person in several ways. Humans have brains; a robot’s brain is actually a computer. Humans sense things using their eyes, ears, nose, and mouth; a robot has special sensors that allow it to detect light, temperature, pressure, sound, or motion. Humans have nerves and cells that carry information to our brains; robots have actuators that carry information from their sensors to their computer brains. The idea of robots is not as new as you might think. There is a long history of humans imagining what a robot could be. As early as 850 B.C., the Greek poet Homer described bot-like creatures that did anything their masters asked. In 1495, Renaissance man Leonardo da Vinci drew up plans for a “mechanical man” in his notebooks. In 1961 the world’s first robot started assembling cars at a General Motors plant in Ewing, New Jersey. Ten years later in 1970, Roboticists in Stanford, California built the first robot that could move and sense its surroundings. In 1996, researchers at Honda introduced P2, the first human-like robot. 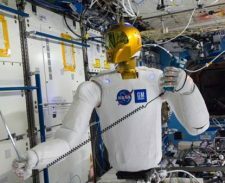 And in 2011, R2 was launched to the International Space Station, making it the first human-like robot in space! Any interesting area of study in the field of robotics is called Biomemetics. Basically, specialists in biomemetics study and borrow ideas from nature as they design robots. For example, they have developed a robotic lizard that is able to go into disaster zones (e.g., areas impacted by earthquakes) and use robotic sensors to search for survivors. Another example is robotic snakes called ‘robosnakes’ that are increasingly being used by surgeons to assist in operations (since they are able to flex and move around internal organs with ease). While it’s beyond our capabilities here in the library to actually design and create a functioning humanoid robot, we were definitely able to create a working model of an articulated hand. Robotics scientists, especially those who work in Biomemetics, understand the importance of observing and understanding how something actually works in nature. Thus, before you can design a human-like robot, you need to understand how a human being moves and thinks and reacts. 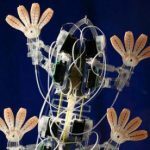 Designing a movable, articulated hand model gave our scientists an opportunity to study how their own hands work from the inside out. This project has fairly straightforward steps, but implementing the steps can be a little “fussy” and does require some important “trial and error.” It was a great way for our SEC scientists to practice focusing and conducting their own “trial and error” processes as the hand projects came together. PRE-STEP. I gave my scientists a little headstart by preparing the strings they would use for their hand models. I dug out our library craft supply of beads with pre-drilled holes, threaded a long string (about 24 inches long) through each bead, and then knotted one end of the string so that the bead would not slip off. [Each scientist will need 5 strings for each of their fingers on the hand model.] Later, as the scientists start threading the strings through their straw pieces, this bead will prevent the thread from pulling too far through the model (i.e., the threads will not pull completely out of the model). STEP 1. Each scientist needs to trace their hands on the foam sheets with the pencils. You should only need about a half-sheet (full sheet = 8.5×11) per scientist. As you trace, you want to be sure your fingers are a little spread apart so each finger is clearly separated and defined. Also, you only need to trace the hand to the wrist. STEP 2. Once the tracing is done, it’s helpful to lay your traced hand back on top of the outline and make pencil markings where each of your knuckles naturally are (where you would naturally bend your fingers). This is a big help with later placing straw pieces on your model. Then you are ready to cut out your traced hand. OPTIONAL STEP. If you want to use a stick – I used takeout chopsticks – to create a handy way to hold your model, I found it best to tape it down to the foam hand FIRST. You can just tape it straight in the middle of the palm. It will fit just fine – though snuggly – between the third and fourth fingers. STEP 3. Once the model is cut out, the real trial and error work begins. Using tips from the Go Science Girls blog, I instructed my scientists to leave large spaces between straw pieces. Basically, you are creating straw pieces in-between all of the normal bending joints on the fingers. For example, for each index finger you will need 3 small straw pieces for the finger itself, and then one longer piece that spans the length of the palm. Once you cut the small pieces and tape them in place on the finger, you then need to thread one of the strings through the pieces (once string for each finger). The real test happens when you pull on the string. If the finger does not bend as you would expect – if it seems to lock before bending completely down toward the palm, then you likely will need to unthread the finger and cut the small straw pieces even smaller. FINAL STEP. Once you are happy with how each threaded finger works, I would recommend tying an additional bead on the bottom end of each thread (so that the threads don’t pull back through the straws). You may also want to trim the threads so that they are shorter and less likely to tangle before tying the additional beads on the bottom ends. This entry was posted in Science Explorers Club and tagged articulated hand, robotics, robots on November 29, 2017 .